In the last few years, two kinds of movie have run their course: zombie films and horror remakes. Sadly, like the walking dead, neither seems to know when to give up the ghost. So imagine how astonished I was to have walked out of Breck Eisner’s update of George Romero’s The Crazies last night, feeling uplifted and satisfied. Maybe it’s because this is based on a little-known cult film, or because the story’s monsters aren’t technically zombies; either way, the movie feels—for the most part—like original horror, and I’m all about going for a ride I haven’t taken before. 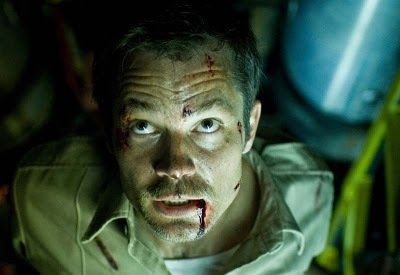 Set in Ogden Marsh, Iowa, The Crazies tells the story of David and Judy Dutton (Timoty Olyphant and Radha Mitchell), the town’s sheriff and doctor, respectively; they’re happily married, and recently found out they’re expecting a baby. What they weren’t expecting was a downed government cargo plane that crashed in a nearby swamp, leaking a biochemical weapon into the Ogden Marsh water supply. When people drink the tainted water, they go murderously insane. The trailer might lead you to believe that this is another “town-besieged-by-zombies” movie, and it kind of is, but mostly isn’t. In the Romero tradition, it’s about human relationships, incompetent and untrustworthy government, and everyday fears magnified to the nth degree. Seriously, it’s not a zombie movie. In fact, the military sweeps into town very early after the madness breaks out and evacuates all of Ogden Marsh. David and his deputy, Russell Clank (Joe Anderson), return to rescue Judy, who’s been improperly diagnosed as being a crazy-in-waiting, and locked up in the high-school-turned-mental-hospital. For the rest of the movie, the small band of survivors—and a few other people who pop in and out—must make their way to the town limits and avoid trigger-happy soldiers as well as the few crazies who weren’t swept up or executed in the raid. There are no ghoulish hoards here; no scenes of people boarding up doors; and no re-animated corpses, either—when a crazy gets shot in the head, that’s it for them. Two things make this a very successful movie. The first is that the screenplay by Scott Kosar and Ray Wright goes far in establishing the small town community of Ogden Marsh. Tired archetypes are scrapped in favor of natural characters that one might encounter on a trip through the heartland. It would have been so easy to paint David Dutton as either a macho hero or a down-on-his-luck shlub in need of redemption, but as written—and as performed by Olyphant—he’s a perfectly average guy who likes the people for whom he keeps the peace. And those people aren’t portrayed as rubes, either, which is also refreshing. The normalcy of the townspeople makes what happens with the weapons spill both tragic and terrifying. The second selling point is Eisner’s direction. I’d be surprised if he hasn’t watched a lot of horror movies, because he seems to go out of his way to avoid the genre’s sillier cliches and fake-outs. He gradually turns up the heat on his characters and lets the story unfold naturally. The Crazies is not a showy picture, but rather one that creates genuine suspense. Eisner’s gift is that he doesn’t cheapen that tension with flashes of gore or pointless jump-scares; more often than not, there is no “payoff” for the build-up. A prime example is an early scene in which a woman goes into a barn, where her husband has started up the thresher at three in the morning. The way the camera fetishizes the gleaming, whirring blades and switches between wide shots of the machine and close-ups of the woman, the outcome is inevitable, right? Not in this case. I won’t spoil what happens, but it’s a great use of direction and mis-direction. Granted, I didn’t love The Crazies; though I liked it a lot. There are a few moments where Eisner calls back some of the scares that worked in earlier scenes, but to a lesser effect. Also, I don’t buy the film’s climax at all. Then again, I’m neither an expert in geography, physics, nor small-grade nuclear weapons; suffice it to say, if you bought the idea of a refrigerator shielding Indiana Jones from the effects of an atomic bomb, you’ll probably be okay with this film’s final action scene. In fact, it is followed by an effective ending that almost made up for the previous two minutes. Then again, this is followed by a credits-sequence coda that makes absolutely zero sense, and feels like a studio executive’s note. These are nitpicks that mostly bothered me after I’d left the theatre; while the movie was going on, I was full on-board with the story and the suspense. It’s ironic that George Romero has released two zombie movies in the last five years—with one in the can, awaiting release—and neither of them are as good as two remakes of his earlier works. The new version of The Crazies and Zack Snyder’s Dawn of the Dead update from 2004 prove that remakes—or re-imaginings, or whatever the hell market researchers are calling them this afternoon—don’t have to be lowest-common-denominator bores. These two films, though not original ideas, have distinct voices and are aimed, I think, at moviegoers who don’t necessarily love horror movies. Eisner and Snyder know that thrillers should thrill, and not get weighed down in confused political messages or special effects (they also have a penchant for opening their movies with Johnny Cash songs). If only more remakes were about vision rather than brand recognition, I think we’d see an ironic end to the argument that Hollywood is creatively bankrupt. Note: My dear friend Meghan made me aware of a phenomenon whereby some moviegoers require a bit of "liquid courage" before going to see horror films--I guess it keeps the nerves from getting too rattled. For my money, I'd say The Crazies is a two-shots-of-Patron motion picture.